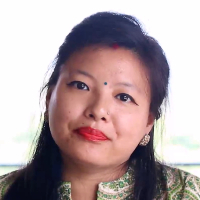 Nikita Thapa did her schooling from CJM, Dehradun and then her graduation from St Bedes, Shimla. After her graduation she did her B Ed from Kurukshetra University. Working as a teacher in Olive International School, Qatar. Kindergarten teaching is integrating young children into the world of learning by teaching them social skills, personal hygiene, basic reading skills, art, and music. "After doing my graduation from St Bedes College Shimla, I did my B Ed from Kurukshetra University. Working as a teacher at Olive International School, Qatar."